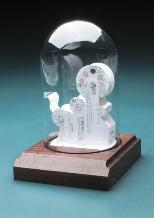 One of our original custom designs, the Stock Ticker Sculpture under glass is a great gift for stockbrokers, financial planners, traders, analysts and bankers. Just 20 business cards are turned into this terrific old-time stock ticker. Perfect for retirement gifts or sales awards. A business gift that looks great on a desk or shelf and will last a lifetime. We have more than 60 business card sculptures under glass including the popular doctor and golfer! They’re a great gift because they are personalized using the recipient’s business cards.